Lizzie Armitstead admitted that she thought her chances of a rainbow jersey at the 2015 World Championships were over during the breathtaking final lap of the women’s road race. Armitstead was the sole British rider in the peloton over a minute behind nine lead riders with 15km of the Richmond course remaining but she rode tactically superb finale to bring herself back into contention and dispatch her rivals in a thrilling end to the race. “It was a case of being willing to lose the race in order to win it, I knew that from last year, I had to be patient and I had to gamble,” she said. “Until the very last, until we caught them [the break], I thought it was over. 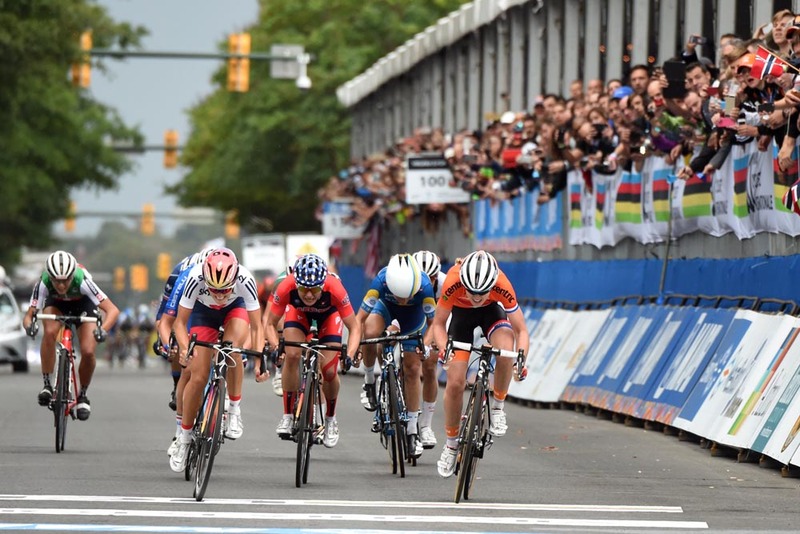 Armitstead benefitted from a chase led by the Netherlands inside the final seven kilometres which hauled back the all but two riders – Italy’s Valentina Scandolara and Australia’s Lauren Kitchen – on the final time up the cobbled climb of Libby Hill. Armitstead then attacked to draw out her rivals on the steep cobbles of 23rd Street before attacking again on the final drag up Governor Street. Faced with leading out the sprint, she waited on the left hand side of the road, tucked in behind the wheel of Anna Van der Breggen, and overhauled the Dutch rider to the line. She explained that once she hit the front of the field, the race went exactly as she had planned. “My gameplan before the race was exactly how I raced. I wanted to attack on Governer Street, I knew that I needed to get rid of people like [Giorgia] Bronzini and Jolien [D’Hoore],” she said. Although none were present to help her in the final lap, Armitstead praised her young GB teammates Alice Barnes, Lucy Garner, Molly Weaver, Jessie Walker and Hayley Simmonds. “Although I was quite isolated towards the back end of the bike race, going into it I was in a great mindset because I was surrounded by such great girls,” she said. “That meant that I believed in myself today, and I knew that I had to race selfishly and patiently.